To support this initiative we employ the use of shadow accounts (mirrored local accounts). 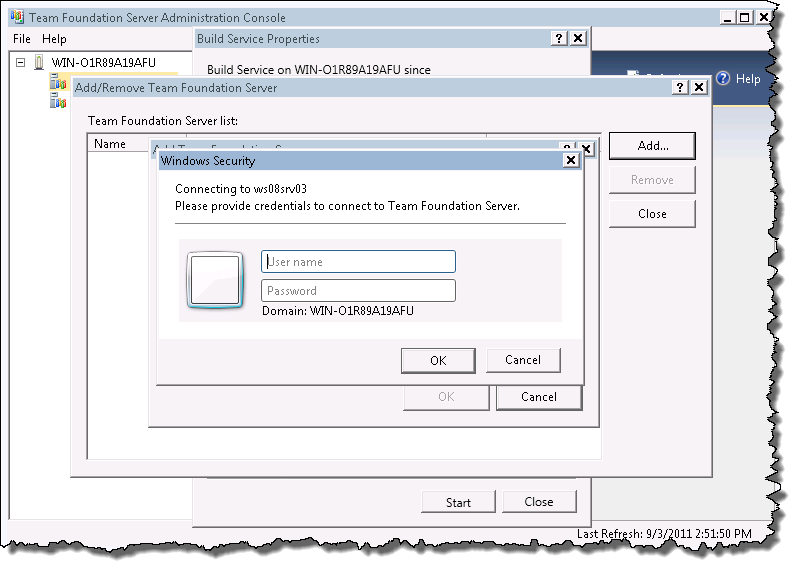 In our test case we created local accounts named “localTfsBuild” on the Team Build Server and Team Foundation Server Application Tier using identical passwords. 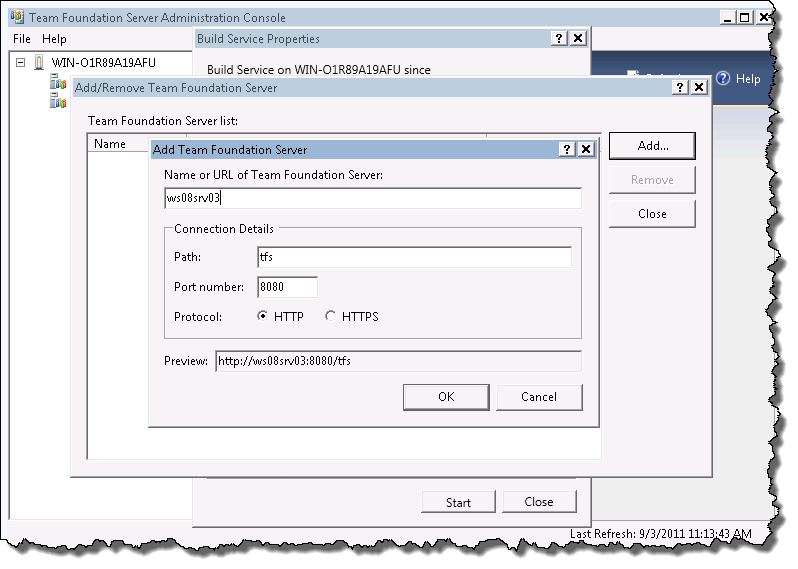 A host entry was also added on the Team Build Server with the TCP/IP address and host name of the Team Foundation Server Application Tier. 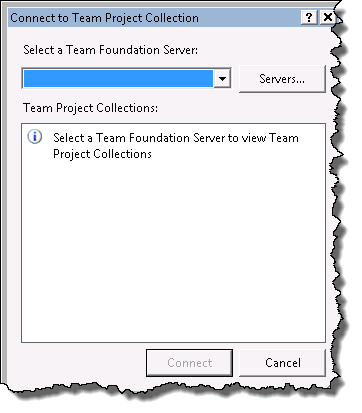 Using the Team Foundation Server Administration Console on the TFS Application Tier we add the local account created above into the “Project Collection Build Service Accounts” group. 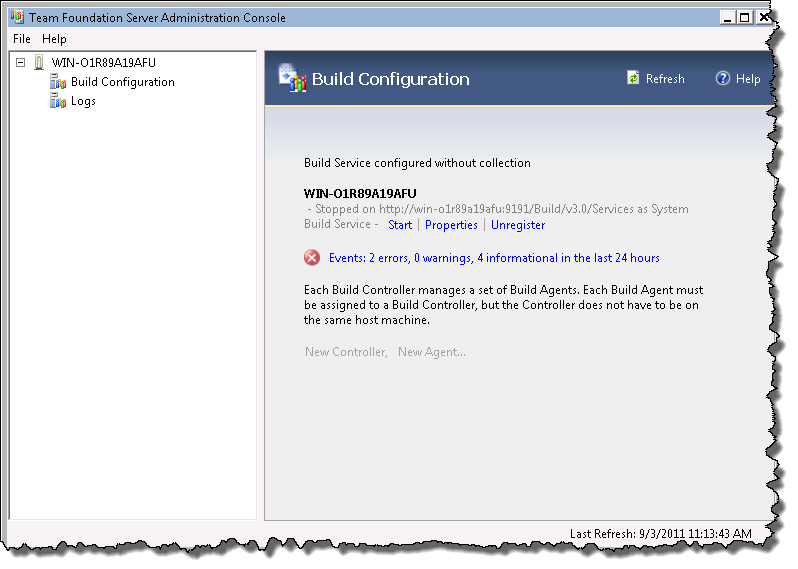 The Build Service is installed but not configured initially, with the Project Collection information added later. 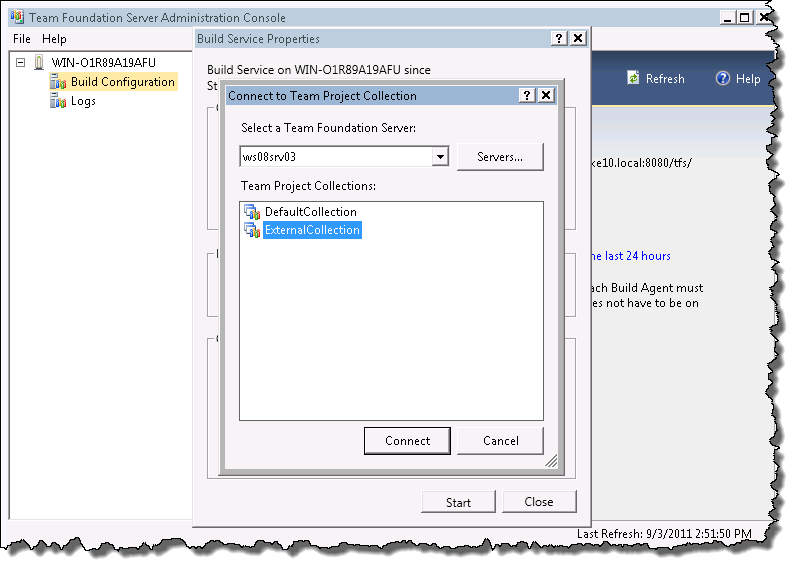 In the build configuration wizard don’t select a project collection just leave it blank, then use network service and get to the end. If you made it here then the service should be running and configured, if you received an error connecting verify the localTfsBuild account is the same on both machines and that the passwords match, do not specify an alias for the TFS server use the real machine name and if a DNS lookup is not available make sure the name and IP address of the TFS server is defined in the local HOSTS file of the build server. If the Agent does not start, you must make sure your build server resolves from the TFS side of the network (try PING) if the HOST name does not resolve to an IP then add it to the DNS. 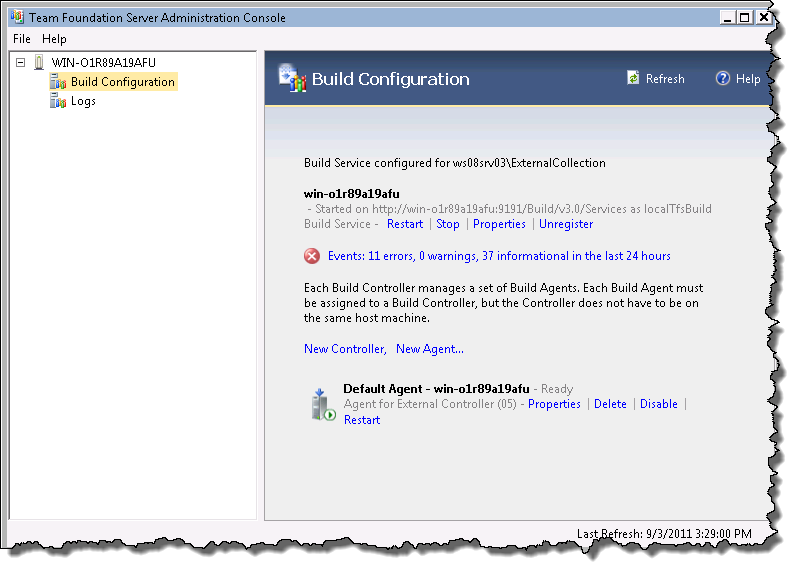 Use the Test Connection on the Build Agent Properties dialog to test communications between the Build Agent, TFS Server and Build Controller. If you have still have connection issues verify the Windows Firewall is not causing your problem, verify the network connection shown in Network and Sharing Center is either Private Network or Domain Network otherwise inbound traffic will fail. Wes, thanks for your post. 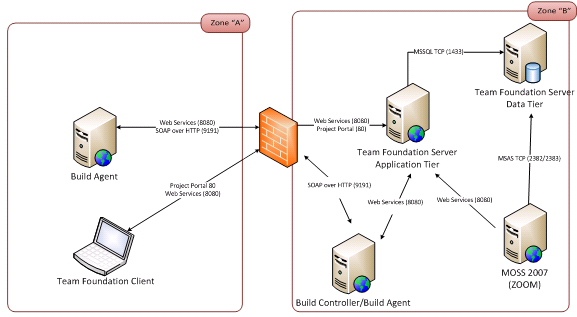 After reading this, we could configure build agent as workgroup envrn. 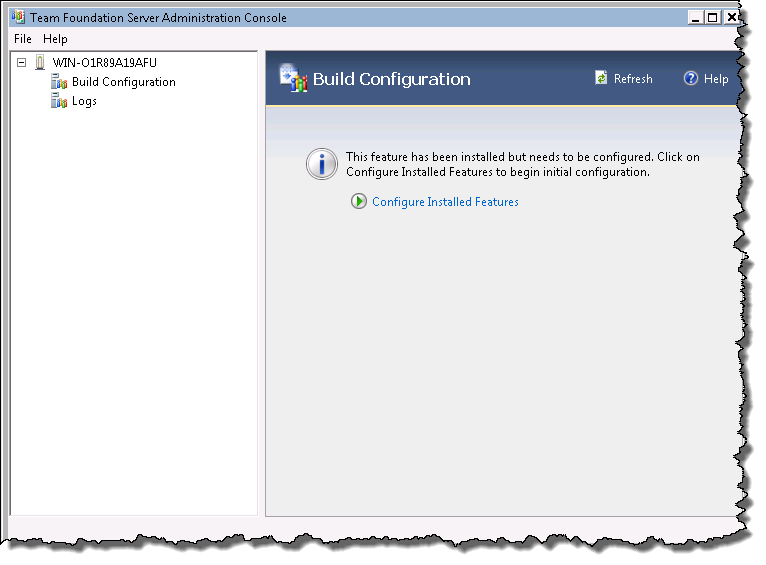 However, it only works for those machine that running as server 2k3, but for window server 2008 R2. 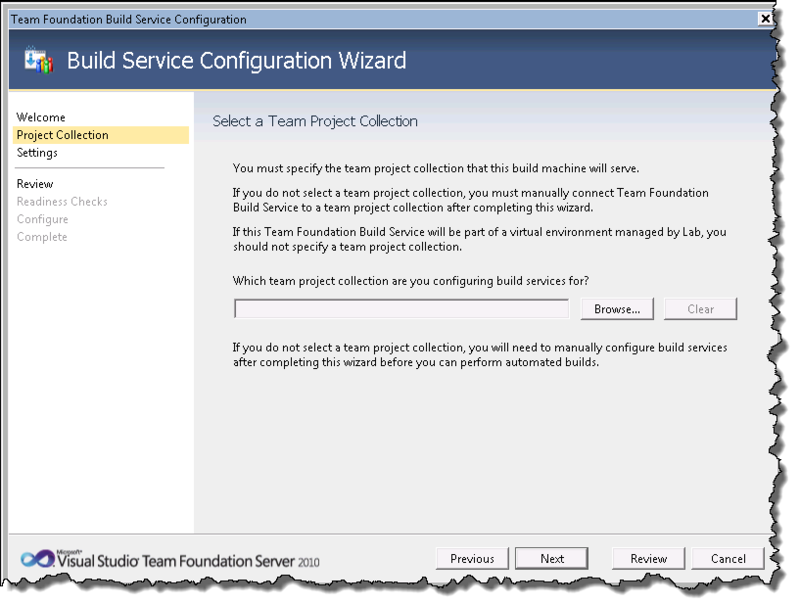 We could register the build service to TeamProject collection, but when creating an agent, it’s always stopped or at unknown state. What operating system that your build server running on? I did the walkthrough on Windows Server 2008 w/SP2 (x32). It should not matter though, what error are you receiving when you try to create the agent? I don’t get any error. 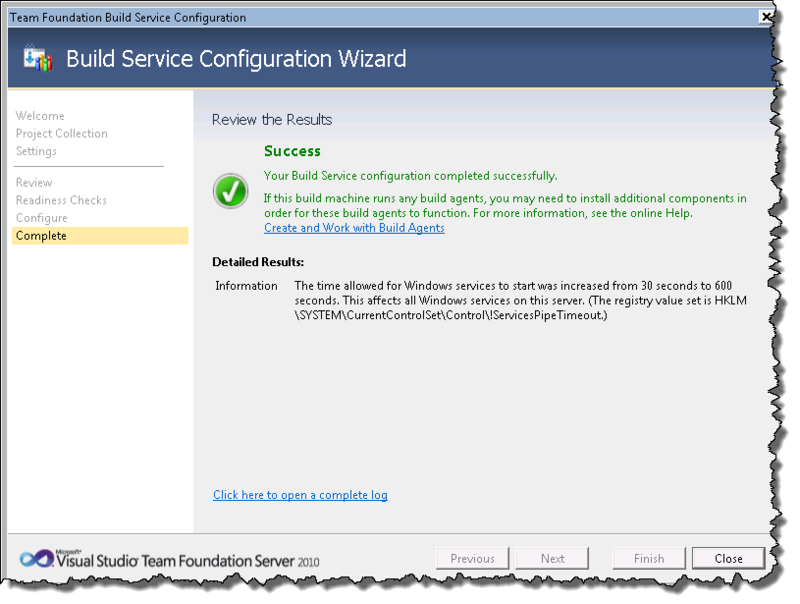 The build service create ok but the agent staying at unknown or stop state somehow. I don’t see any error from event viewer thou. 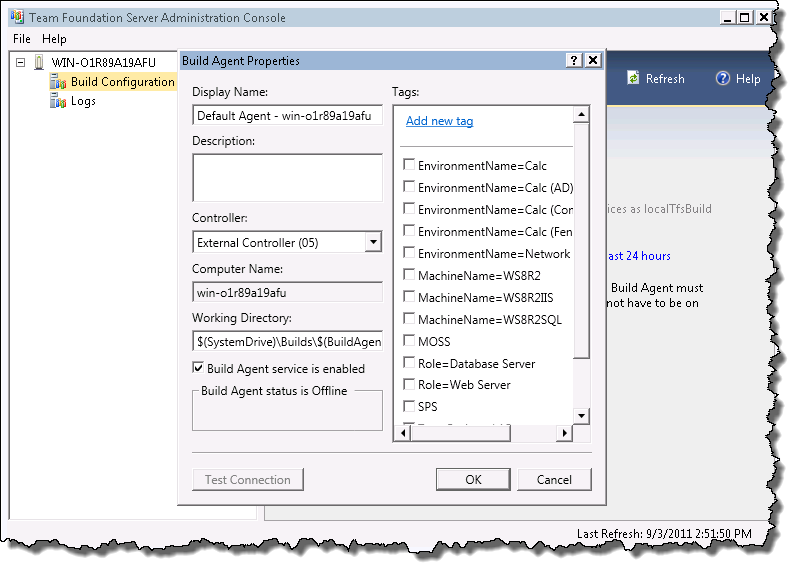 I would check three things: Disable the firewall on the build agent to see if the agent works, then make sure the NIC connection is either set to Private or Domain so the firewall exclusions work properly. 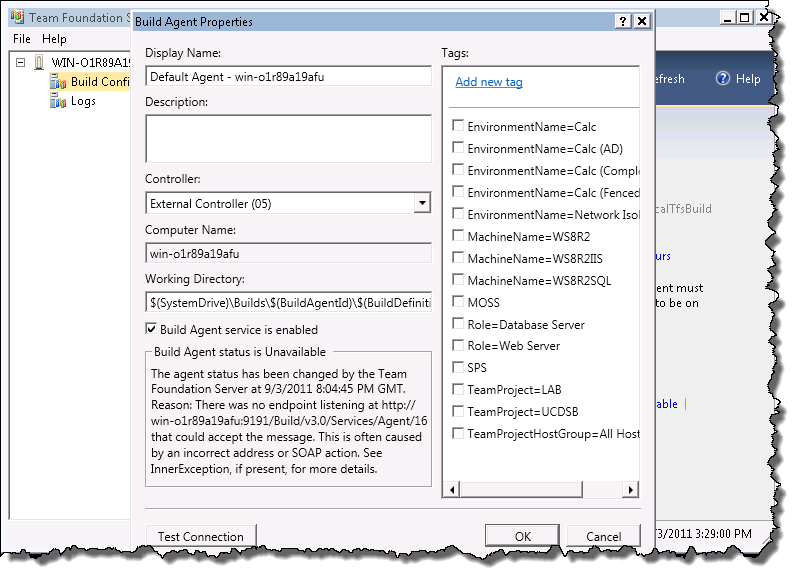 Make sure you can ping the build agent by name from the controller and application tier and the build agent can see the controller and application tier. 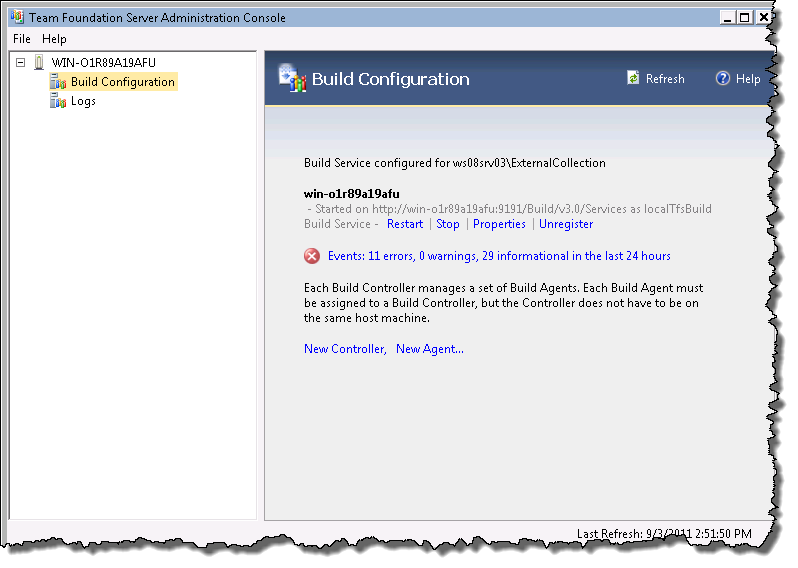 Check the TFS Application Tier and the Build Controller for errors. Does that trick work for TFS11? It should, while I have no tried it I see no reason it wouldn’t work. 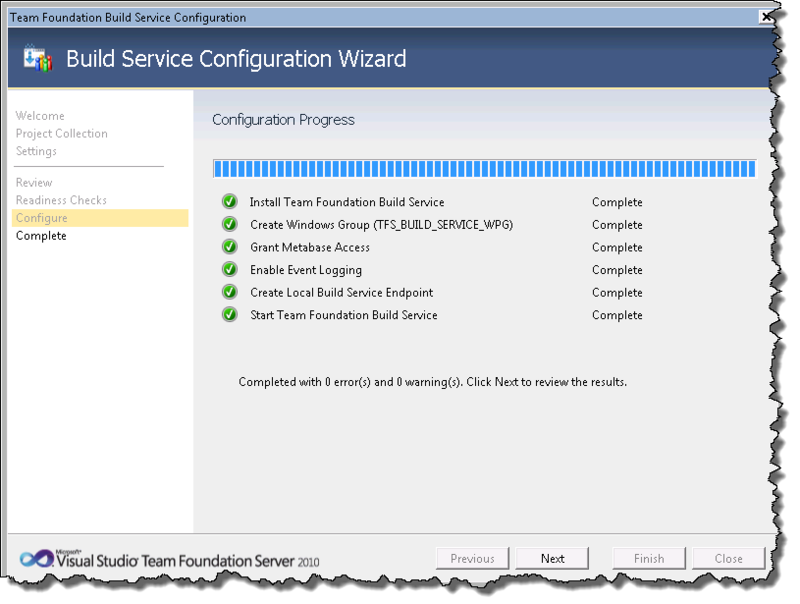 I’m assuming TFS 2012 still works for workgroup environment? Also, by reading online, it’s not really recommended from MS??? 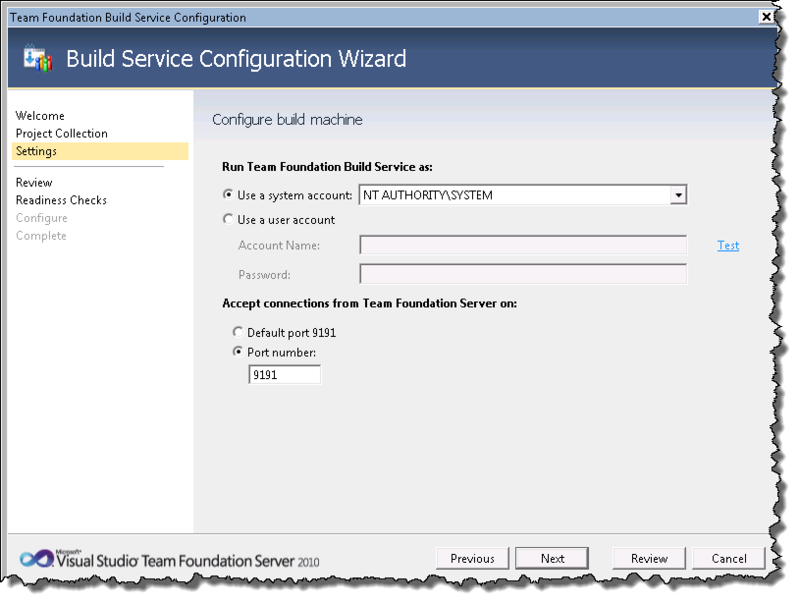 TFS 2012 still works in workgroup mode (using local accounts) but if your build controller and/or agent is on a separate server you’ll have to use mirrored/shadow accounts like you did in 2010 (it is this configuration that is not supported). I was looking for just the same info and lucky to find yours. 1. created a local account (localtfsbuild) on this server. 2. 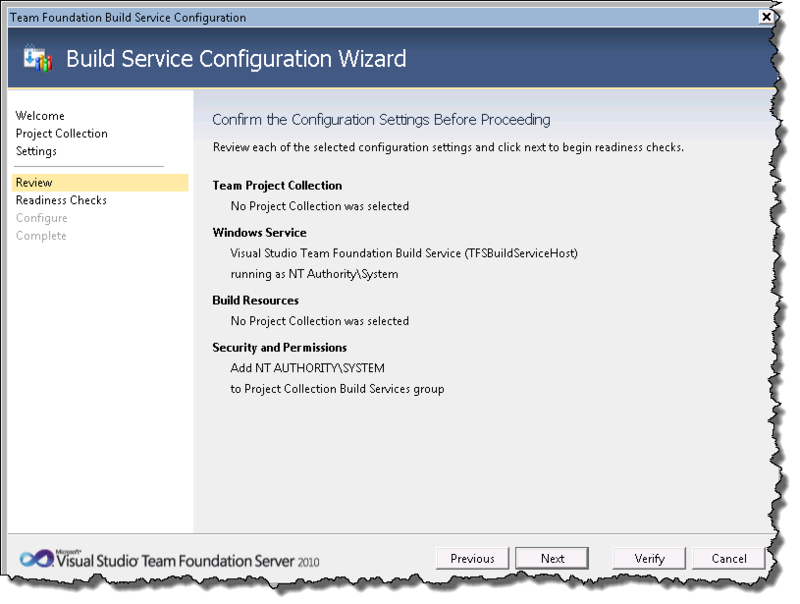 I added the user localtfsbuild into Project Collection Build Service Accounts. 3. 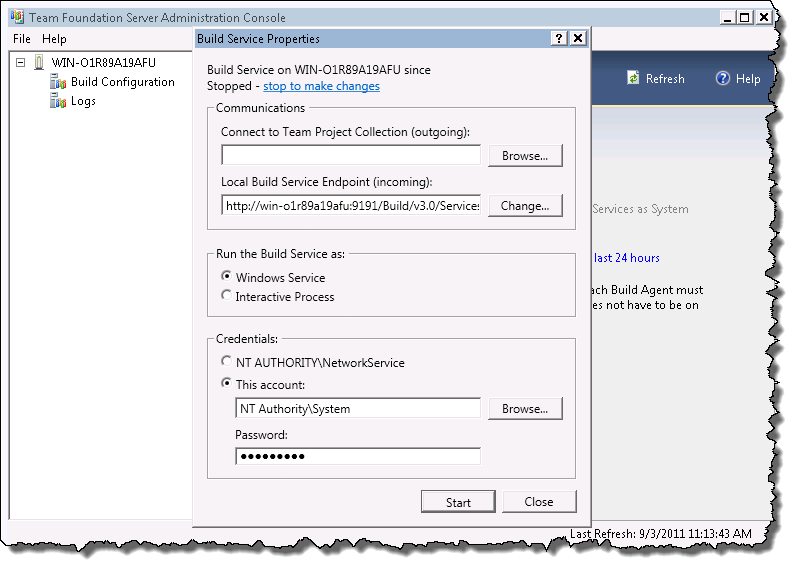 I did build configuration first not selecting any project collection and initially ran under NT Authority\SYSTEM credentials. 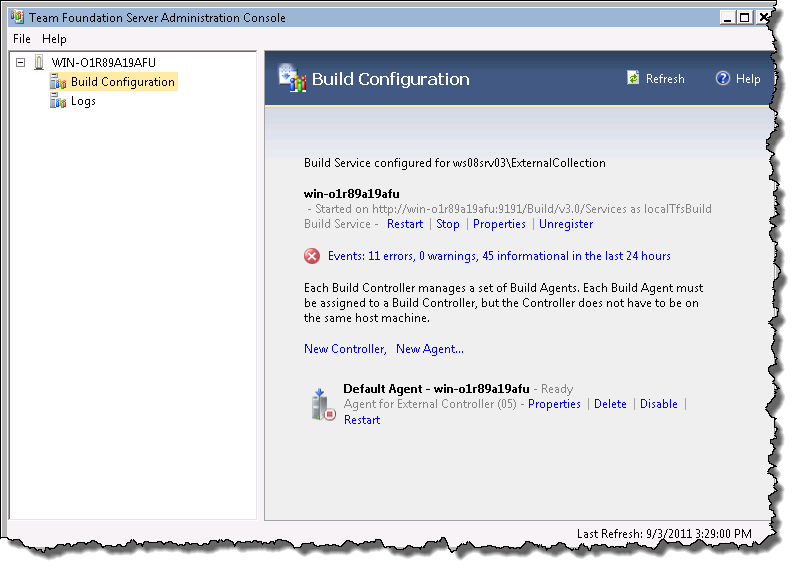 Then added project collection(residing on the same server) and now changed credentials to run under localtfsbuild. We have workstation running Windows XP and in other domain lets say ‘Y’. 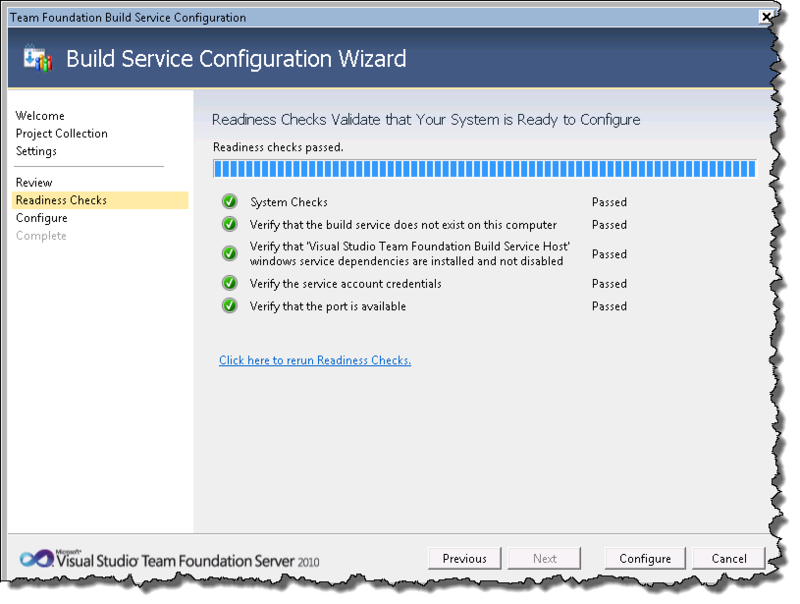 we wanted this to be our BuildMachine so we installed TFS 2010 Build Service and now trying to configure with mirror account as you mentioned. 1. Created localtfsbuild a local account. 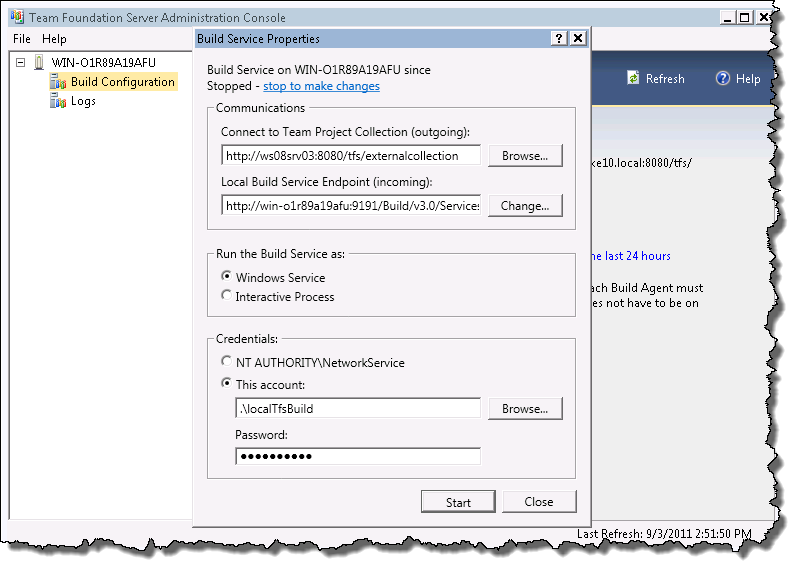 when I was using NT AUTHORITY\NETWORK SERVICE in both Build Server and Build Machine we are running into sgen.exe errors. I don’t know from where the “TFS\” came from. I supposed this is due to the “TFSES\”… Any help here? Any information on this will be greatly appreciated. 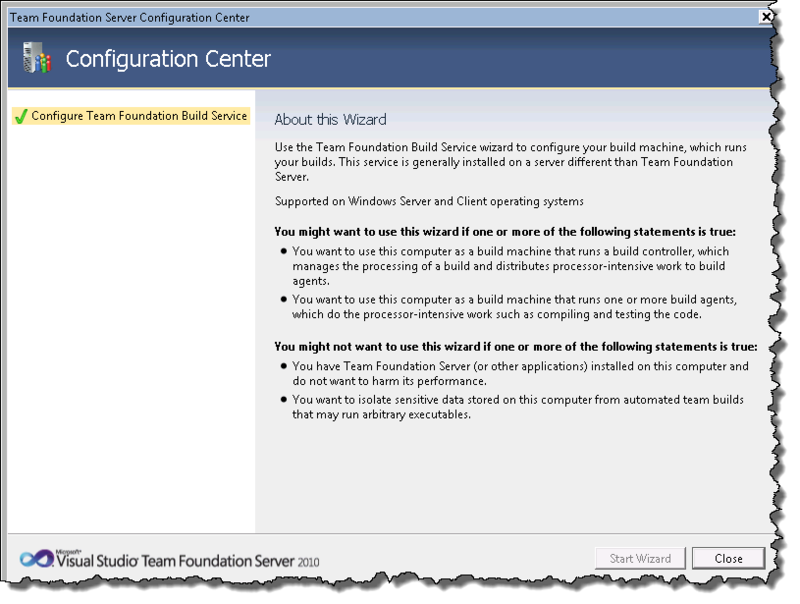 Are you trying this with TFS 2010 or 2012? 1. You created local accounts on both the build server and tfs application tier and the passwords match. I’m trying this with TFS2010. My Application Tier is inside my corporate network but I want to configure the Build Controller/Agent in my client network, so I have different domain and networks and the connection to my client network is through Juniper Terminal Services, so I’m not able to open ports nor map my client IP Address through the HOSTS file. That scenario you describe is not supported. 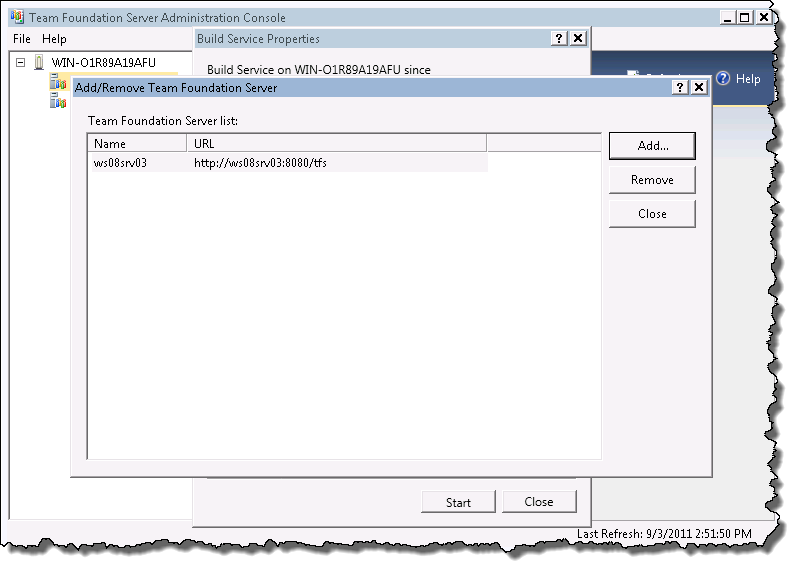 The build agent has to be able to contact the TFS Application Tier directly which is not possible over Terminal Services. 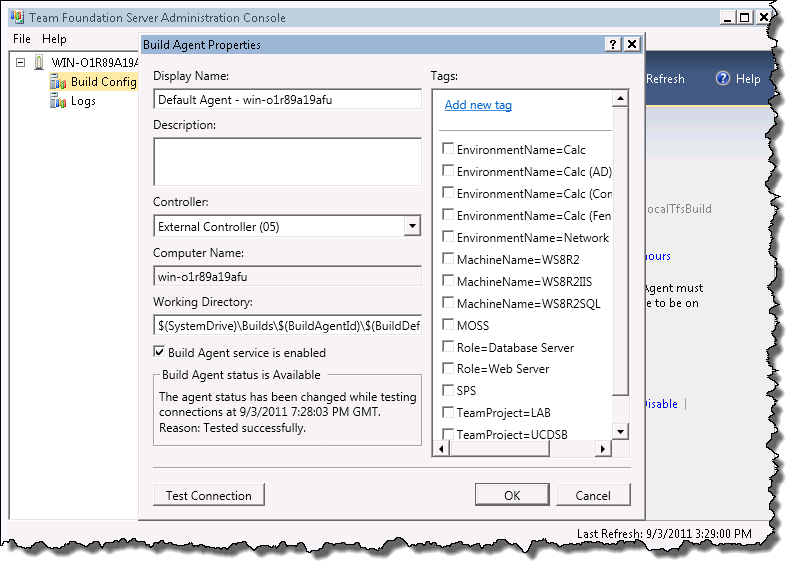 Followed all the steps, however when trying to setup the agent, the “Controller” drop down is not being populate. Could this be a firewall issue? Yes it could be. If you’ve opened TCP port 9191 in your firewall appliance for the Build Agent and Controller you may also have to open TCP port 9192.